Permanent stress can lead to restlessness, insomnia, headache, nervousness and other negative effects. Therefore relaxation is needed for the compensation of daily emotional and mental stress, since mental and spiritual well-being are strongly connected within the body. The goal of Thai Massages is to work on this link: It frees muscular tension, stimulates circulation as well as metabolism, and helps to relieve the body and the mind. 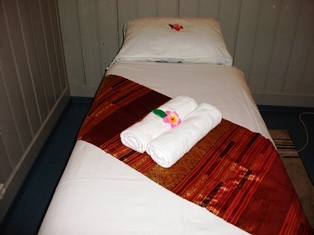 Thai Massages aren’t just used as therapy, but they also help to prevent a plethora of diseases or other illnesses. The experience of a Thai Massage is appreciated and loved by women and men of any age as a very pleasant and harmonious treatment. We offer three soothing massages: A warming oil massage, a back, neck and shoulder massage and a Thai massage in the traditional way. In the pleasant atmosphere of our studio, our experienced team will ensure that you will find an oasis of calm and relaxation. Treat yourself to this soothing experience!